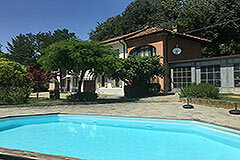 Charming character country house with heated swimming pool Serravalle Monferrato, Asti (ref: 8091)- Character Italian villa with heated swimming pool situated in a charming location close to Asti and just minutes from the Feudo d' Asti 18 hole golf course.. Piedmont Properties in Piemonte. Property for sale Langhe and Piemonte. Map for Property ref: 8091, Charming character country house with heated swimming pool - Character Italian villa with heated swimming pool situated in a charming location close to Asti and just minutes from the Feudo d' Asti 18 hole golf course.